Did Your Love Begin with a SMILE? 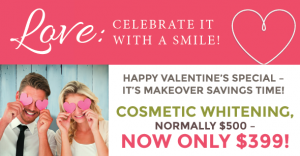 Keep it GLOWING with our Cosmetic Makeover Valentine’s Promotion! This is a gift that keeps on giving, whether you choose the makeover for your valentine or for yourself. Right now we are offering the transformative power of Zoom in-office whitening and customized, take-home, whitening trays for only $399, a treatment package that is usually $500! And if you want something a little extra, talk to us about porcelain veneers or Lumineers. Call and schedule an appointment or stop by and pick up a gift certificate. It’s a Valentine’s gift no one can forget to wear!